Hello lovely ones! It is Shay + Winnie popping in. November is the perfect time to take a moment and breathe. To simply stop and take measure of where you are at, where you have been, the time spent with loved ones and just be in that precious moment. Right now is the perfect time to think upon all your blessings and what matters most. Julie and I feel so blessed because we can do giveaways and help sponsor events, challenges, crafters and the like. What a gift! We do lots of giveaways because we love giving back (we've both been on the other end entering giveaways and know how lovely that is too!) and because we follow the example of people, organizations and companies who do so year after year. One of the most generous and warmhearted of crafters (or anywhere) out there is the incredible Jennifer McGuire. Jennifer is one of those incandescent spirits who make all those around her shine brighter. She is just as genuine, warm, giving, friendly and beautiful in person as she comes across online. She is the real deal. We just love her! There are two really incredible events Jennifer is a part of that we wanted to share with you. As crafters, many of us can agree that we love to create. It makes us happy to make cards, homemade treats, and more. But when we give these creations to others? We make them happy, and nothing is better than that. A simple act of kindness can have a lasting impact, and our world needs more kindness! 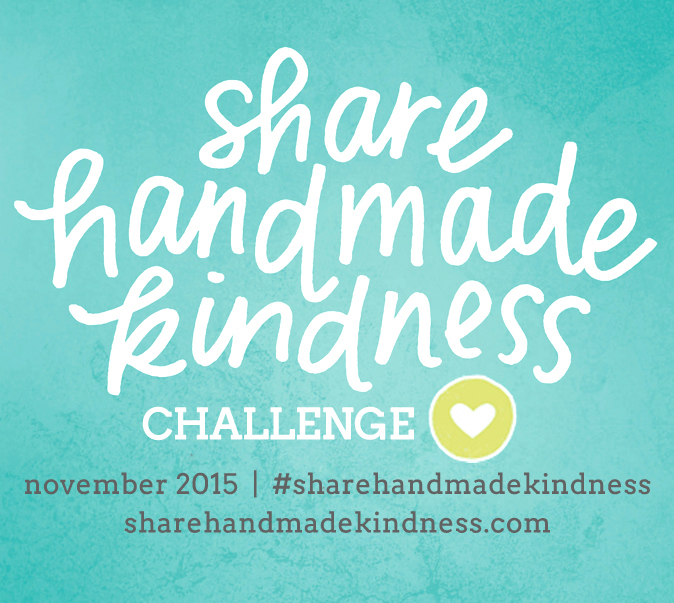 To encourage these acts of kindness, Jennifer McGuire is hosting the Share Handmade Kindness Challenge. Throughout the month of November, Jennifer will be challenging crafters to share an act of handmade kindness with someone. Whether you make a card, a note, or a treat… anything handmade counts. Each week there will be a new challenge, as well as videos, giveaways, and more. For more information, visit sharehandmadekindness.com or jennifermcguireink.com. We are back for the 6th year of our annual Caring Hearts Card Drive… collecting handmade holiday cards to give to those that live in nursing homes. In 2014, we collected over 17,000 cards and distributed cards to many nursing homes in US, Canada and Australia. 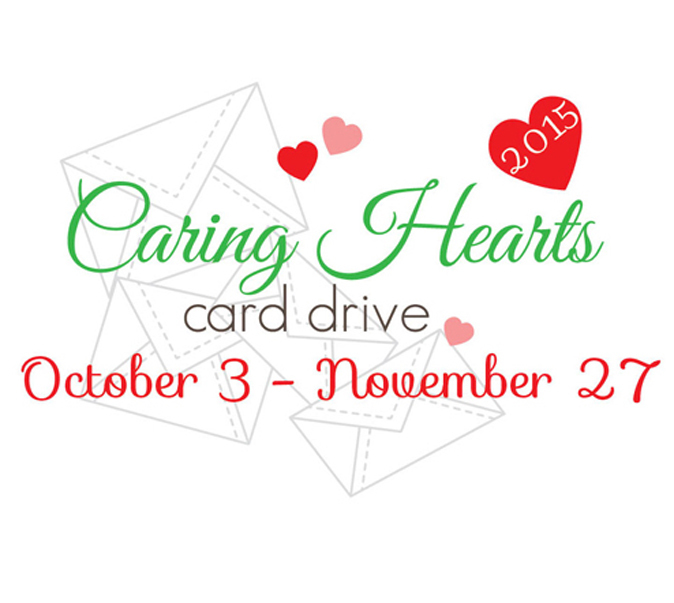 The card drive ends November 27 - we hope you can participate! For more information, visit Vera Yates or Jennifer McGuire." Vera Yates (the mastermind behind this – she rocks – please visit her blog!) and I are excited to be back this year spreading kindness… with your help! We all love making cards and what’s better than knowing our creations can bring a smile to others, right? I promise you that if you participate in either of these events or even both your heart will be a bit fuller and your day will be just a bit brighter because you have made someone else feel special and appreciated. I am working on my Caring Hearts cards and plan to mail them early next week. I feel great knowing that one of my cards may bring a smile to someone's face. Almost finished with my Caring Hearts Cards and am working on my kindness one. I've been very touched by all of the caring and sharing that's been going on all around the blogosphere recently! But I feel the need to give a special shout out to two ladies who, in my experience, have done more caring and sharing than any others. That is you, SHAY and JULIE!!! Although there are many wonderful companies out there, Winnie & Walter has been more generous than any other company I've seen! That's the reason you're my favorite stamp company. You've blessed me personally with your generosity on more than one occasion, and you've made me feel very special, which is the greatest gift you can give someone. Thanks from the bottom of my heart, Julie and Shay, for all you've done and continue to do for the crafting community, and for all you've done for me personally. Love you guys!!! I very much agree with you. I'm working on few cards for the caring hearts cards and it makes me very happy to think that someone will actually be happy to receive a card that I made inspite of its imperfections!! I LOVE sending handmade cards to family and friends all over the world.